At first when we look even at simple gothic calligraphy, it will seem complexe and as if difficult to learn. But once you learn its basics, then it become so easy and you can even modify your own way of this calligraphy, while still respecting its fundamental rules. In 2016, after learning and practising gothic/black letter, it was very amusing to write the names of some of my friends. 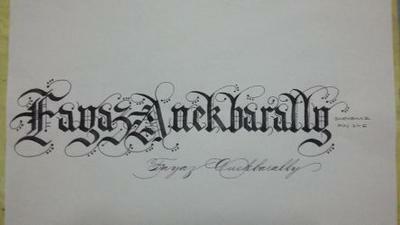 Its a very dynamic style of calligraphy.